Today we are going to discuss Razor.NET (ASP.NET Razor). It is like a wrapper on .NET very useful easy to learn. Before going further as you know I am big fan of WWH so we will use WWH (What, why, how) questionnaires What is Asp.net Razor (Razor.net)? Razor is a free tool by Microsoft by which you can write your Server side code using either VB.NET or C# syntax or you can say Asp.net Razor is new technique for writing code. It just likes your classic ASP & PHP code. You need to write code in design page and server side code start with @ symbol. So it will be easier for you if you have some hand over classic ASP or PHP. As you know in the near future everything is on Mobile, PDA, and touchpad and most probably on HTML5. So great news is as per my thought Razor is developed just because of that goal. It is simple and easy to use. It helps in Mobile web development. What is CSHTML & VBHTML Extension? CSHTML & VBHTML are new file extension in Razor. The CSHTML file denotes that code is written in C# language and VBHTML denotes that code is written in VB.NET. What is @RenderPage () function in Razor? which we will discuss in our next post. see the error detail in below snap. So the reason behind this he is using AJAX script manager not AJAX toolkit script manager. Now you have question when to use script manager and when to use AJAX toolkit script manager so my suggestion is always use AJAX toolkit script manager because it is faster than script manager in many ways and if you try to find difference between AJAX script Manager & AJAX Toolkit script manager then you will find AJAX toolkit script manager is best option for enhancement of your web app performance also. 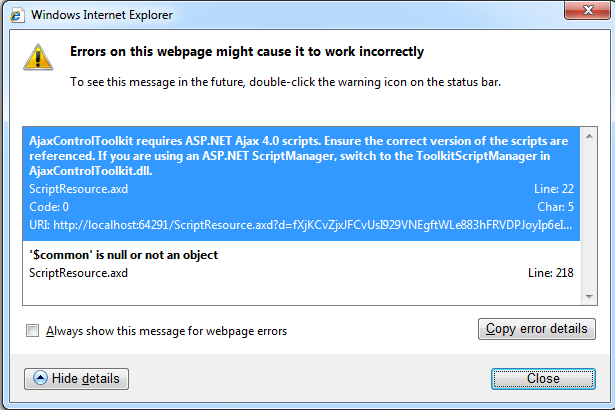 Today I am going to share one more interesting utility provided by Microsoft which is called “Microsoft Ajax Minifier”. Microsoft Ajax Minifier is a utility which will help you in minimizing the size of your Java script and CSS. You can use this by command prompt. In this way after successful execution if you see the size of CSS file it significantly reduced as shown in below fig. AJAXMinifier remove all the unwanted white space, curly braces and use short hand in declaration and many more techniques for reducing the size. I hope this will help you and me also in performance boost.